Spend as much time as you like at Hotel Ariotto in the Monferrato hills. Relax by the panoramic pool, ride a variety of scenic loops or combine both for a truly relaxing and enchanting sample of the Piemontese lifestyle. Piedmont Cycling Resort is barely one hour from Milan’s Malpensa airport – the perfect location for designer-outlet shopping excursions, guided visits to Torino or Milano, vineyard walks followed by candle-lit dinners, wine-tastings and more. 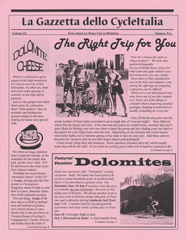 We can make non-cyclist’s dreams come true! Hotel Ariotto’s been CycleItalia’s HQ for almost two decades. Choose from hotel (B&B) lodging or a self-catering apartment (1 week minimum) to maximize your enjoyment. In addition to the wonderful Monferrato and Piemontese specialties Chef Paolo likes to treat us now and then with specialties from his home region of Sicily. Not only that, more great ristorante and osterie are just steps away as is a well-stocked market, bakery and pharmacy. Our entire rental fleet is 100% artisan-made-in-Italy and exclusively equipped with Campagnolo component groups. CycleItalia’s Piedmont Cycling Resort is strategically located in the UNESCO World Heritage Site of Monferrato, barely one hour from Milan’s Malpensa airport. Hotel Ariotto, CycleItalia’s HQ for almost 2 decades offers customized services for all cyclo-tourists. Your hosts Heather and Larry have created unforgettable, quality, tailored cycling holidays in Italy with bike routes along a variety of flat, hilly and mountainous routes, all with very little motorized traffic for all levels of riders, from avid recreational to competitive. 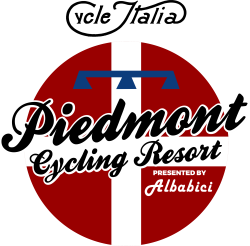 With plenty of non-cycling activities as well, Piedmont Cycling Resort offers an unforgettable vacation opportunity for all.